Thomas, V. C., Chaudhari, S. S., Jones, J., Zimmerman, M. C. and Bayles, K. W. (2015). Electron Paramagnetic Resonance (EPR) Spectroscopy to Detect Reactive Oxygen Species in Staphylococcus aureus. Bio-protocol 5(17): e1586. DOI: 10.21769/BioProtoc.1586. Thomas, V. C., Sadykov, M. R., Chaudhari, S. S., Jones, J., Endres, J. L., Widhelm, T. J., Ahn, J. S., Jawa, R. S., Zimmerman, M. C. and Bayles, K. W. (2014). A central role for carbon-overflow pathways in the modulation of bacterial cell death. 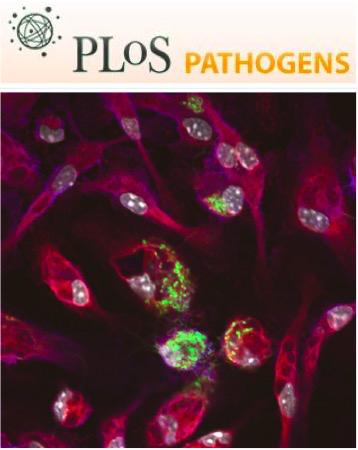 PLoS Pathog 10(6): e1004205. Under aerobic conditions, Staphylococcus aureus (S. aureus) primarily metabolizes glucose to acetic acid. Although normally S. aureus is able to re-utilize acetate as a carbon source following glucose exhaustion, significantly high levels of acetate in the culture media may not only be growth inhibitory but also potentiates cell death in stationary phase cultures by a mechanism dependent on cytoplasmic acidification. One consequence of acetic acid toxicity is the production of reactive oxygen species (ROS). The present protocol describes the detection of ROS in S. aureus undergoing cell death by electron paramagnetic resonance (EPR) spectroscopy. Using 1-hydroxy-3-methoxycarbonyl-2,2,5,5-tetramethylpyrrolidine (CMH) as a cell permeable spin probe, we demonstrate the detection of various oxygen radicals generated by bacteria. Although standardized for S. aureus, the methods described here should be easily adapted for other bacterial species. This protocol is adapted from Thomas et al. (2014) and Thomas et al. (2010). Glucose (Sigma-Aldrich, catalog number: G8270 ). To obtain starter culture, inoculate a single colony of S. aureus into 3 ml sterile TSB supplemented with 14 mM glucose and incubate overnight in a 37 °C shaker-incubator adjusted to 250 rpm. Inoculate 25 ml sterile TSB (suppl. with 35 mM glucose) in a 250 ml flask with starter culture to a final OD600 of 0.06 and incubate in a 37 °C shaker-incubator adjusted to 250 rpm for a period of 72 h.
Following the 72 h incubation period, 10 OD600 units (~7 x 109 cfu/ml) is harvested in a 1.5 ml Eppendorf tube and suspended in 1 ml of ice cold KDD buffer. The bacterial suspension is placed on ice until further use. Prior to EPR measurements, the ROS sensitive spin probe CMH (working stock ~4 mM prepared in KDD buffer) is added to a final concentration of 200 µM in 1 ml bacterial suspension (step 3), briefly vortexed (2 sec) and allowed to stand at room temperature for 15 min. The bacterial suspension (50 µl) is then transferred into micropipettes by capillary action and sealed at the distal end using Critoseal, immediately prior to EPR analysis. EPR acquisition parameters are as follows: Field sweep width, 60 gauss; microwave frequency, 9.75 kHz; microwave power, 21.9 mW; modulation amplitude, 2.37 gauss; conversion time, 10.24 ms; time constant, 40.96 ms.
Record 2-D spectra and average 10 scans for each sample to reduce background noise. Quantitation of EPR spectra and baseline correction can be accomplished using Bruker WinEPR Data Processing software. To identify the contribution of superoxide (O2−) and hydroxyl radicals (OH˙) to the overall EPR spectra, SOD (400 units), an O2− scavenging antioxidant enzyme and/or DMTU (20 mM), a OH˙ scavenger, may be added to the bacterial suspension (step 3) prior to the addition of CMH and incubated at room temperature for 15 min. Continue with step 4 of this protocol. Note: It is crucial to have a negative control (step 4; KDD buffer containing 200 µM CMH) when acquiring EPR signals. This control will report the degree of auto-oxidation CMH has undergone over the period of the experiment. Figure 1. EPR detection of S. aureus ROS production. A. Following inoculation of S. aureus to an initial OD600 of 0.06, cultures were incubated aerobically (flask: volume ratio= 10:1, 250 rpm). Culture samples for EPR analysis were withdrawn at 3 h, 24 h and 72 h of bacterial growth. B. S. aureus culture samples (72 h) were treated with either 400 units of SOD, 20 mM DMTU, or vehicle (wild-type, WT) before addition of the spin probe, CMH. The basal extent of CMH autoxidation in KDD buffer (blue line) was determined as control. This work was funded by NIH grant nos. R01-A1038901 (KWB), PO1-AI083211 (KWB), R01- HL103942 (MCZ), and American Heart Association postdoctoral fellowship 12POST12080155 (VCT). The EPR spectroscopy core is supported, in part, by a NIH Center of Biomedical Research Excellence (COBRE) grant (1P30GM103335-01) awarded to the University of Nebraska's Redox Biology Center. This protocol is adapted from Thomas et al. (2014) and Thomas et al. (2010). Thomas, V. C., Kinkead, L. C., Janssen, A., Schaeffer, C. R., Woods, K. M., Lindgren, J. K., Peaster, J. M., Chaudhari, S. S., Sadykov, M., Jones, J., AbdelGhani, S. M., Zimmerman, M. C., Bayles, K. W., Somerville, G. A. and Fey, P. D. (2013). A dysfunctional tricarboxylic acid cycle enhances fitness of Staphylococcus epidermidis during beta-lactam stress. MBio 4(4).